Ballad for The Unborn: I almost felt like listening to the entrance of Division Bell of Pink Floyd. This song is actually an intro for the album. Mostly distortion affected piano sound is accompanied by a minimal percussion and (starting after the first minute) the bass. 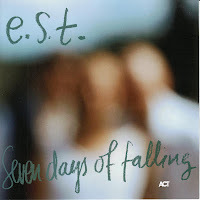 Seven Days of Falling: I have felt the great synchronization and harmony between these childhood friends again in this song. The bass entrance of Dan Berglund was enough for me to hear rest of the song at the first second. Other instruments were playing in my head. I can feel Magnus Öström’s kick from left followed by his stick from right. The timing and the spirit are just perfect. Esbjörn Svensson’s virtuosity and his technical authority on the piano makes this song a masterpiece. He has a certain control over the piano sound, he even knows the time it passes for the sound to fade or stays there. As far as I have seen in their live performances, they don’t look at each other while playing. They have a strong inner sound of each others. They just know about what the other’s doing. Even in most progressive improvisations, they are as fast as lightning to decide and do. You can never understand which one of them triggered the trio for a progress or a change in the rhythm or deciding on a solo partition. I know that most of their studio recording is also created spontaneously. They enter the room, play a little and record it. When they are ready and there is the spirit, the resultant piece is another gift to the world. Mingle in the Mincing-Machine: This is among the songs that I ask myself “What are they playing to produce that sound?”. This piece is literally in a new genre I have invented: progressive modal acid jazz. I know it sounds strange but you can find all of them in it. The transitions are perfectly defined and the tension is always under control by both Magnus and Esbjörn. During the improvisation part after the first half; Magnus Öström, shows us again how a great drummer he is, but it is more probable that the audience give attention to the great piano performance of Esbjörn which is recorded in front of the others. At the end of the song, an E.S.T. classic is heard, the main theme that is played in the entrance, is played back. Evening in Atlantis: This is a short break with solo performance of Esbjörn Svensson. There is a certain similarity between the overall sound and Erik Satie Gymnopedies. Did They Ever Tell to Cousteau: The entrance is from Magnus Öström by a very simple and strict rhythm with a daily sound, almost feels like coming from a buck. It continues till to the end without any change. The melody is given by the bass first, then Esbjörn accompanies Dan Berglund. Later on, a great amount of distortion is added not only to the bass but also to the piano, making this piece almost a progressive rock song. The piano and bass improvise the main theme by means of some electronics. Believe, Beleft, Below: The song is as soft as silk. I know that Esbjörn Svensson is a virtuoso, who play the classics very well and inspired by Bartok. He played classical masterpieces in a very delicate and unique manner in some spare time just before the recording sessions. Actually we can make a loose generalization that most excellent jazz pianist are also very good classic performers. Moreover, making compositions (such unique and unrivaled compositions) you should be very well equipped with classical music both by performing and by reading the compositions. Musical spirit is a kind of fluid thing that should not be in a predefined box, it should be free for you to see the real shape. I have read in several reviews that Magnus Öström may be the best contemporary drummer considering his unique technic in brush using. In this piece you will understand why. Esbjörn Svensson sounds like (I think) Keith Jarrett in this piece. Elevation of Love: Here is another very strange and interesting entrance: A processed bass and a piano introduce the melody by changing the role from time to time; one is for the main melody, the other one is for accompaniment. This is a great chat between them. Later on, Esbjörn Svensson carries the improvisation to higher levels, where he can also control the tension of the others. Magnus Öström carries out a noisy rhythm full of crashes but mainly by using the snare drum. "Wow" is the expression you will use when you hear the electro-contrabass of Dan Berglund. I think one unique feature of Esbjörn Svensson's Trio is the extraordinary style used by Dan Berglund. In My Garage: A very dark theme is carried out by the trio in the first minute. Later on, following some solo performance of piano, some signals from Esbjörn Svensson lights the fire of improvisation. First the drum-set is burned by filling the spaces. The bass is rather walking behind. Esbjörn Svensson is a genius. I see it again in this song. Why She Couldn’t Come: A piano solo for the first notes is rarely accompanied by the bass. The entrance of Magnus Öström with his brushes make this one a very emotional piece. All members of the trio softened their touches. We hardly hear some electronics behind supporting the mysteriousness in the composition. O.D.R.I.P: A very energetic entrance for the last song welcomes us. This is almost a rock piece considering the bass tone. The piano is played very strongly and aggressively. The piano sound contains too much reverberation that the notes become overlapped with each other. After the instant 1:45, the bass starts to sound distorted from deeper frequencies. Magnus Öström gives the tempo by strong beats on cymbal. On the background the drum creates the necessary loudness for the tension. The trio starts to improvise after the third minute. You feel that they have lots of things in mind to give to the world of music. They are passionate about music. Look at the perfect timings of Magnus Öström. Only a drummer can understand how difficult it is to carry out tempo for such improvisations. The trio is calm now after the first half where a deep double-bass, fading drum and piano are going to the end. By waiting only for 1 minute we meet with the hidden track Love is Real: Inspired from the piece “Believe, Beleft, Below”, this time with a very harmonious male vocal, Josh Haden, the son of Charlie Haden. This is the first and last piece in E.S.T. albums that have lyrics and vocal. The lyrics is also written by Josh Haden. The first live performance of E.S.T. for Love is Real was given with Nils Landgren's vocal on a concert in Germany in July 2003. Later on, this piece was performed by many artists. We can see it also in Viktoria Tolstoy's Shining On You album whose compositions are made by Esbjörn Svensson (actually the pianos are played mostly by Esbjörn Svensson with the nickname Bror Falk but he does not want to be heard with another project at that time than E.S.T.). After Esbjörn's passing away this emotional song became like a mourning symbol for him. Several artists performed Love is Real after that in many memorial concerts. As a ritual, ACT Jubilee Concerts in their 20th years ended with Dodge the Dodo followed by Love is Real at the encore sometimes sung by Caecilie Norby, sometimes sung by Nils Landgren. For me, this is a perfect song.